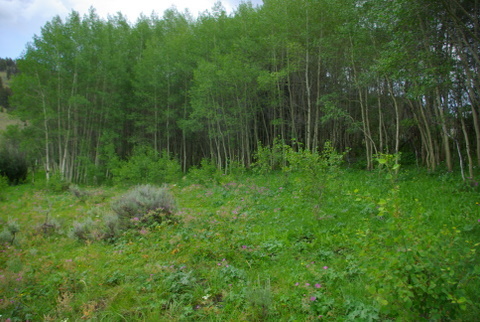 Strong evidence that aspen groves are becoming healthier with presence of wolves. Healthier aspen groves support more bird species, which may in turn help the overall health of forests. One thing mentioned in the article is that the pine beetle infestations seen throughout the west could be impacted with greater diversity and larger populations of birds. This has been well documented in Yellowstone Park, but it is interesting to see it happening in other wolf range too. Discussion about wolves often focuses on how wolves impact elk populations and behavior and how that affects hunting. Should wildlife management agencies focus solely on this or should they focus on the ecological benefits of wolves as well? One could argue that the focus on wolf management is too narrow and that people should look beyond their narrow interests and look at systems as a whole. Here is another question to ponder. Can these benefits be realized on public lands impacted by heavy livestock grazing? Tracking science: Biologist’s findings show forest diversity, health influenced by wolves. By Michael Jamison. Missoulian. Most wolf occupied country, however, shows such a great impact from cattle, it is probably hard to sort out indirect effects of wolves on the vegetation. Cattle eat from half to 90% of the forage on most grazing allotments, leaving little for the elk, deer, pronghorn. As a result, the effect of changed elk behavior due to the wolves will probably be hard to document. MY wife met a professor from Oregon State by the name of Bill Ripple, who is with the Dept. of Forest Ecosystems and Society. His email is bill.ripple@oregonstate.edu. Karin said his presentation on ecosystems was very good. What is fascinating is the back of his card are side by side photos, one of an area before wolves, and one after wolves have been introduced. Landscape after wolves is much more lush and diversified. I would urge any of you to email him and ask him to send you the pics…. This brings me back to a comment I heard in the discussion following the wolf movie shown here at the Roxy few weeks ago…. One rancher woman stood up and said “We have aspen and wolves on our ranch”. She asked us wolf lovers to have compassion for her and almost cried…..
gline: it is an effective tactic to ask for compassion on a personal level. But what about compassion for entire “ecosystems” that are in decline or polluted”. Yes, I totally agree, however this night was about wolves specifically. She wasn’t asking for compassion from us for her problems with turtles… or other animal. I urge you to obtain a copy of “Lords of Nature” which discusses this in detail. It contains lengthy interviews with Dr. Ripple and Cristina Eisenberg. The movie also emphasizes the stark difference in wolf management between Minnesota, Montana and Idaho. I have a couple of extra copies that I’ll donate. All I ask is that you circulate them to get this message out. Contact me if you’d like a copy. Ralph will give you my email. I wonder if Dr. Ripple has any research indicating whether wolves in cattle country produce the so-called “ripple effect,” or whether the presence of cows leaves only the direct effect of wolves, such as changing the behavior of their prey? A interesting article on wolves I just came across, not directly related sorry, but thought you may be interested. Nathan….thanks. Shows how important it is for the family structure to remain intact. Humans can learn alot from wolves.